It has to be done. 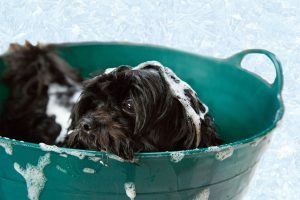 Whether you or your pet dogs like it or not, they need a bath, especially if they are disabled dogs. Because they are not completely mobile, they get dirty faster and more frequently. They drag their body when they move, they get dirty in their own pee or poop, or they get in to littles accidents such as spills and falls. Because they are disabled, there is a right way of giving them a bath. Here are some tips on what to do and what not to do when giving your disabled dog a bath. Have a regular schedule for their bath. Generally speaking, disabled dogs need to take a bath more often than normal dogs, which is usually once a month. Twice a month is usual for a disabled dog, but this may not be true for all dogs so you have to base it on your own dog’s needs. You do not have to stick to this schedule all the time, though. If you think they need a bath earlier or later than scheduled, then go for it. The important thing is to use the schedule as your guide. You may even change the schedule if you think it is necessary. Using the proper shampoo is very important when giving your dog a bath. The health of their skin and fur are very important to their overall health, so using shampoo that can damage both can cause a lot of problems. One important rule is never to use shampoos for humans unless specifically recommended by your veterinarian. Most shampoos made for dogs are fine, but use no-tears shampoo for their head and face and a regular dog shampoo for the rest of their body. A dog conditioner is also an option worth considering. Before choosing shampoos, ask for your vet’s advice. Bath time should be a comfortable and fun experience for your dog. This will make them feel relaxed and docile during the process. If they feel discomfort, they may get agitated and anxious. To keep them calm and relaxed, you should also remain calm and relaxed. Do not show agitation when something goes wrong. Try to have fun yourself while giving your dog a bath. Before you know it, you and your dog will really have a fun and good bonding time during their bath. Since disabled dogs are less mobile than a regular dog, they need assistance in positioning themselves for bathing. if possible, use a tub when giving them a bath. You may use your bath tub if your dog is big or a bath sink or portable tub if it is a small breed. Make sure there is ample space for them to fit comfortably. Use a non-slip mat as flooring for your tub to keep them from slipping and sliding. If your dog can still use their front legs but not their hind legs, you can place them in the tub in a sitting position (front legs upright and hind legs resting). This way, its head is up high while bathing. If your dog can make use of the hind legs but cannot use the front legs or if they cannot use both, you need to place them on their side making sure the head is a bit more elevated then the body by using an inflatable, non-slip pillow or something similar. In this position, you have to move them from one side to the other during wetting, shampooing and rinsing. Makes sure that your dog’s legs are not tangled or in an awkward position. Also check that your dog’s tail is free to move. It is also important to use tepid or warm water for bathing your dog. If it is too hot, it may scald and cause harm to your dog’s skin. If it is too cold it may feel uncomfortable and also harm the skin. Water pressure is also important if you use a hose or spray to wet and rinse your dog during bathing. Do not spray your dog directly from a distance as this is painful on the skin and body. Hold the nozzle near the dog and spray in an oblique position so that the water is diagonal to the body. You may also position your finger in front of the nozzle to diffuse the pressure coming out before it reaches your dog’s skin. Do not get the eyes, the inside part of the ears and especially the nose wet from hosing. When a dog’s nose is hit with water, it may give them the sensation of drowning and cause them to panic. That is not a sensation you want them to associate bath time. It is important to clean the back of the ears, but jmake sure water does not go in to the ear hole. While shampooing is important, rinsing thoroughly is even more so. Leaving shampoo on their fur and skin can cause irritation or skin problems. This is why it is recommended to rinse your dog twice. After your dog is well and truly clean, dry your dog’s skin and fur thoroughly. Use a big thick towel to do this. Place the towel flat on the floor or table, place your dog on the towel and rub the fur dry. Do this vigorously but also gently, like giving your dog a massage with the towel. You now have a clean and happy dog. For a little while, at least.